Posted on December 31, 2009 at 3:21 pm in Everything else, Gemma	| RSS feed You can skip to the end and leave a reply. I get to post the first response !!! Wow !!! Wish you and Gemma too a very happy new year. Thanks for spreading the cheer and excitement…. it’s infectious. May you view (good for us) many more films and write your lovely reviews. May Shammi’s charms continue to enthrall in 2010. Gemma IS cute and charming if somewhat disgusted by the bow thing. Happy new year 2010 to you are Gemma as well. And indeed to every reader of this blog. Happy Chasing too – Squirrels AND Shammi!! All the best to you and Gemma in 2010! Sitaji – love your pic. One of my fav dance numbers. Happy New Year to you guys too! A very Happy 2010 to you and yours Greta. Hope all your dreams come to fruition this year. Love the work you have put into this blog thingie. All the best. Squirrels and cocktails is the picturization I want to see. Someone for everyone! I have had many opportunities to observe squirrels and it is my belief that if they had the opportunity, they would be the drunkards of the animal kingdom. A Very Happy 2010 to you both! Right back to Hunnybunny as well! A very Happy New Year to you and Gemma! Here’s to movies, masti, memsaab and memsaabstory!! And a very happy and healthy New Year to you and Gemma. Happy New Year! May you have the strength, time and enthusiasm to carry on your detailed and delightful blog throughout 2010 and beyond. Well in our part of the world we are already into the 2nd day of the New Year. Behraal as the saying goes, once again Happy New Year to both of you. Ur daughter is cute indeed! I would also like to wish all other readers a very happy 2010 ! She IS my daughter! So glad you get that :) Happy 2010 to you too! Happy new year to you too, Memsaab! I don’t think I need to tell Raju anything, he knows what’s going on! :) I do know that when CB says he never saw the script he is not telling the truth, and that he has been a nightmare to deal with from the beginning. He signed a contract with them (and I’m sorry, but I know Raju and he is not the type to pressure anybody) of his own free will and they fulfilled their obligations. Raju has no problems giving people due credit, and I think CB needs to examine his own behavior throughout and stop acting like he’s a victim who has been blindsided, because that is absolutely not the case. And that’s as much as I want to say about it to anybody! 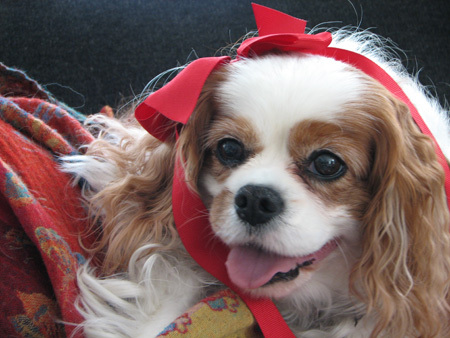 She is a Cavalier King Charles Spaniel, which is a really unwieldly name for a 20 pound dog :) Same to you for a happy blogging 2010!